A physical posture, the third limb of Patanjali's eight-fold path of yoga. A yoga retreat is a safe environment where you can step back, take time to watch your thoughts and behaviors, change your perspective and thus, change your attitude. It’s an approach to break out of your routine and set up another one. At least for a brief period, you stop living the way you usually live. You step away from the overcrowded confines of your local yoga studio, and into a place that offers you the opportunity to practice away from distraction while surrounded by inspirational settings. When on a yoga retreat, how we see ourselves and how we see the world changes from the inside out. The changes we experience, and our new outlook, stay with us way beyond the days of the retreat. The ripples are deep and long-lasting. Dani Z Yoga retreats do not only fulfill your need and yearning for a break from the ordinary, they also nourish your body and mind so that you return home feeling restored and enlivened. Stay Tuned. More to come in 2018. For information on future retreats, contact me. 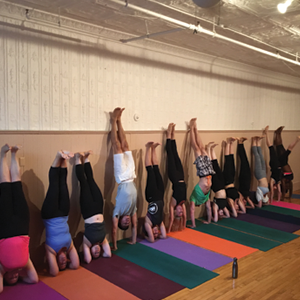 Inversions 101: Living Beyond Limits - SOLD OUT! These Yogi's ROCKED IT OUT at the Inversion Workshop!! STAY TUNED FOR THE NEXT WORKSHOP. MORE TO COME!